Figure 1: Circular ripples associated with the first detected sun-quake from the 9 July 1996 flare. The quest to understand the energy release and transport processes in solar flares is one that many solar physicists have taken up over the years, and since the advent of routine space-based observations we have learned huge amounts about the processes that might be operating in the upper atmosphere. However, despite these advances it turns out that Carrington and Hodgson’s first observation, in 1859, of a solar flare in white-light gave us a glimpse of just how important flare effects at and beneath the photosphere really are. Back in 1972 Wolff  predicted that solar flares could and would impact the solar interior. It took us another couple of decades to unequivocally detect this phenomenon in the form of ‘sun-quakes’  as seen in Fig 1, and since then we have learned that the acoustic signatures of sun-quakes correlate well with hard X-ray (HXR) and white-light (WL) emission , suggesting possible roles for direct particle precipitation, back-warming and hydrodynamic shocks  in driving the acoustic emission. The ‘McClymont jerk’  which occurs as the result of the re-structuring of the coronal field is another possible explanation. Despite these advances, a very small number of observations mean that the jury is most definitely still out on the cause of these interesting phenomena. Figure 2: Egression power snapshots for the 9 September 2001 flare, with MDI on the right and GONG on the left. 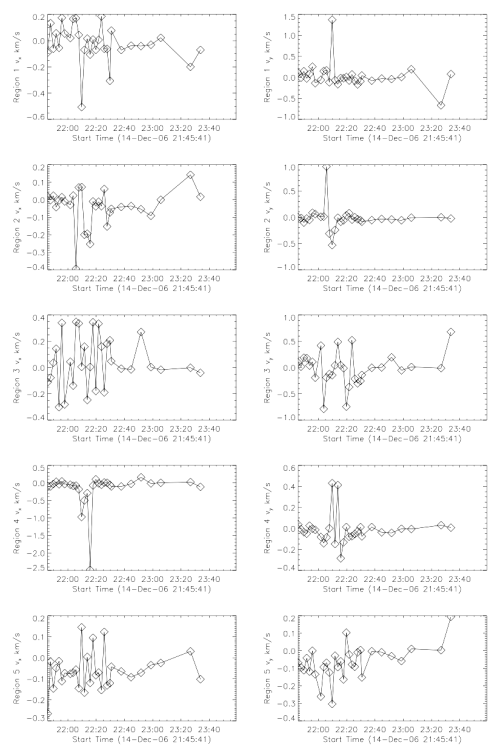 Sun-quakes are most reliably detected using the Dopplergram observations made by the MDI instrument on SOHO. Unfortunately the number of flares for which these data are available is extremely limited and until recently ground-based observations were thought to be too badly affected by atmospheric distortions to be useful for studying quakes. However, applying cleaning techniques  we are now able to detect the quakes using Dopplergram data from the GONG network. This can be seen in Fig 2 which compares the GONG and MDI observations for the flare on 9 September 2001. Using both time-distance (TD) techniques  and acoustic holography  we have shown that GONG shows the signatures of the quakes (albeit weaker) in 3 flares already identified as having quakes by MDI . This opens up the possibility to detect many more quakes for flares where MDI data weren’t available. 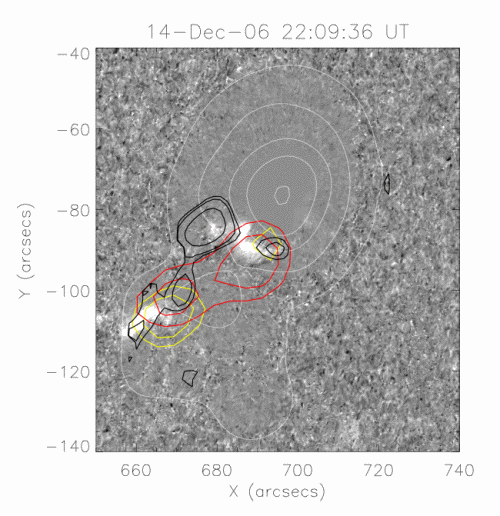 On the basis of this we have been able to use the GONG data to detect quakes associated with the X-class flare of 14 December 2006, which was observed in many wavelengths by the Hinode spacecraft. These observations gave us an opportunity to compare the flare signatures in HXR, WL and the photospheric magnetic field, with the acoustic response to try and distinguish the relative roles of the processes described above in creating the sun-quakes. Fig 3 shows an overlay of the HXR, egression power (acoustic signature) and white light (G-band) during this flare. 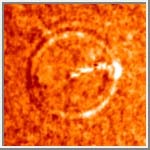 Figure 3: Gray-scale difference image of the flare in the G-band, with contours of the sunspot overlaid in white. Contours of the 20 - 30 keV HXR emission are shown in red, and 40 - 100 keV in yellow. The thick black contours show the egression power located in the North HXR source. The interesting thing to note about this figure is that the strongest acoustic source doesn’t seem to be associated with the strongest HXR or WL sources, although these regions do also show an acoustic response. The Narrow-band Filter Imager (NFI) on Hinode’s SOT lets us examine how the magnetic field changes in these regions, both in terms of flux and motion of the field itself. Figure 4 shows the velocities derived from the regions around the acoustic sources (1-4), where we see magnetic field changes that are spatially and temporally well correlated with the acoustic emission, and from a control region (5). Now, the flare will affect the radiative environment where the Fe I line that is used to measure the magnetic field is formed, so we should use appropriate caution, but it seems that large horizontal motion of the magnetic field is seen in the vicinity of the weaker acoustic sources, but not in the region of the strongest source. Figure 4: Horizontal velocities derived from the displacement of the magnetic field in the regions associated with acoustic signatures. Sun-quakes have the potential to provide us with important new constraints on the flare process and how the solar interior responds to explosive energy release in the outer atmosphere, and the observations described here open up the possibility to detect many more flares with sun-quakes . The event presented here, which does not appear to agree with the most popular sun-quake generation models, also encourages us to examine more closely, and start to challenge, some of the current thinking on their origins .